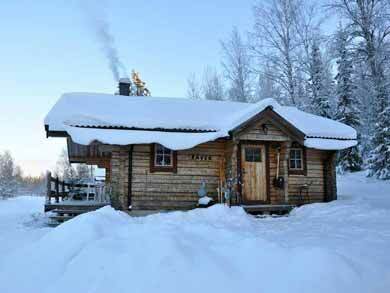 This cosy, recently-restored cabin with sauna and own terrace is your base for days spent playing in the snow. Fully-equipped with wood burning stove, Cabin Ebba has everything you need for your winter holiday. The cabin sleeps two persons in a double/twin room with a sofa bed for additional adult or child. Be as active as you wish, or just relax and enjoy the special atmosphere of wintertime. Photo: TET. Winter trails are found on your doorstep and lead the way to explore the area in any way you choose, with cross country skis, skates and snowshoes available to hire as optional extras. If you are a beginner, a cross country skiing lesson is available before you head out on the trail to practise your new-found skills. 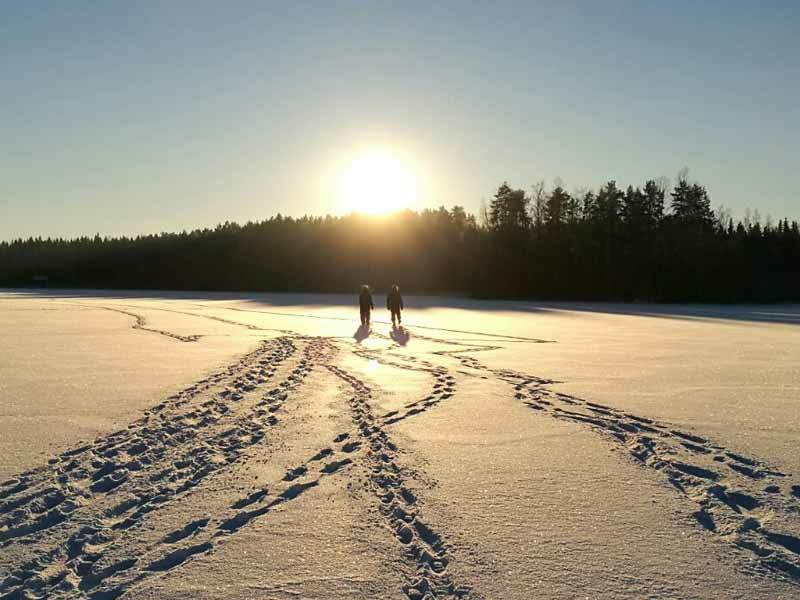 Prepared tracks over the frozen lake offer the opportunity to try the unique freedom of skating on natural ice, or you may wish to have a go at ice fishing! The cabin lies approx. 800m from the lake. 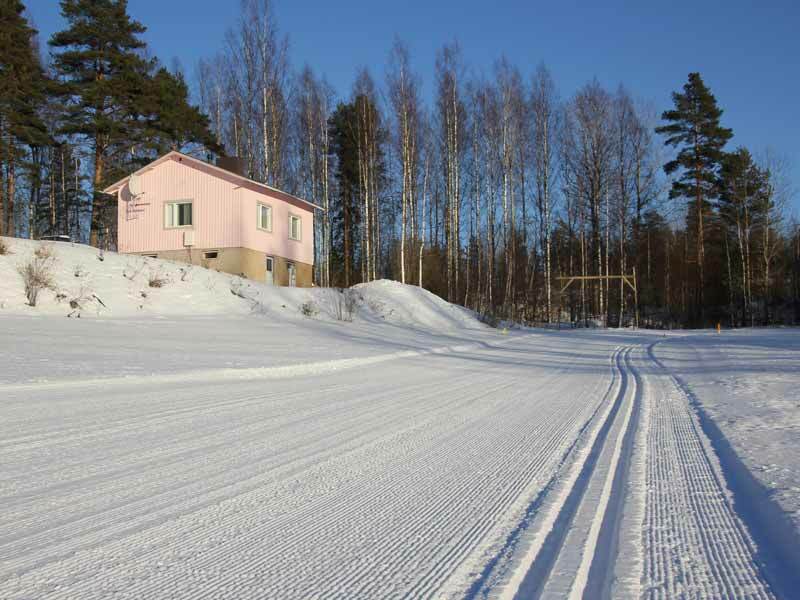 Prepared trails for cross country skiing start right from the cabin. Photo: TET. There is also a wood-fired sauna - a very Finnish experience and the perfect to relax after a day of winter outdoor activities as the sun goes down. 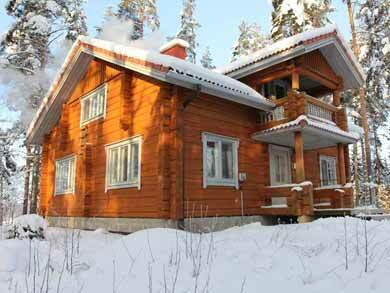 The Romantic Winter Cabin with Sauna in Päijänne Tavastia is ideal for those looking for an active winter getaway with cosy accommodation. For stays between late April and late October, the cabin also has an outdoor hot-tub, though please note this cannot be used during the winter season when temperatures are below zero. The cabin is available for booking year round. Season for winter activities typically mid-December to March, summer activities season May to September. Cross country ski equipment: Skis, boots and poles - classic or skating skis available. Please provide height, weight and shoe size when booking. NB: There is a terrace with seating area and grill which also has a hot tub, however the hot tub cannot be used during wintertime. 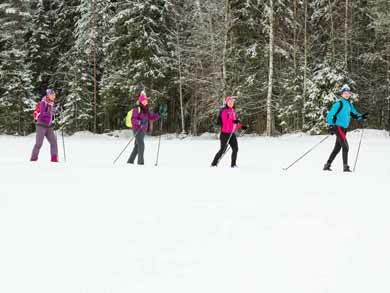 Cross country ski trails from 6 to 11 km are available from your doorstep. 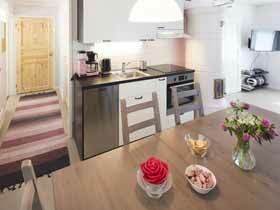 Food: The cabins are fully-equipped for self-catering. The nearest shop is 4km away, 10 mins by car. NB: Please note if you choose not to have a car during your stay that you may wish to purchase all provisions for your stay before leaving Sysmä. There are no facilities where the cabins are located. It is 4km from the cabins to the nearest stores, so if you wish to replenish supplies during your stay, it is possible to walk to the stores. Alternatively, you may wish to walk in one directly and return by taxi with your shopping. Fly to Helsinki for train (1 hour) or bus (1 hour 15 mins) from Helsinki airport to Lahti + bus to Sysmä (1 hour 15 mins), from where transfer is available as an optional extra. Train from UK to Stockholm (Sweden) for ferry to Helsinki and onward travel to Sysmä. Compare our range of winter accommodation experiences. Romantic Cabin with Hot Tub in Päijänne Tavastia is the summer version of this experience.